Not only that, you can also earn double RP for flying under bridges and for completing lessons at the San Andreas Flight School. Launch yourself directly into the double GTA$ & RP Versus Missions when starting up GTAV, by pressing a single button when prompted on the GTAV loading screens. Since there are so many modes to get through, Rockstar will be switching up the Playlist every couple of days. Enjoy and find some frenemies in the forums! 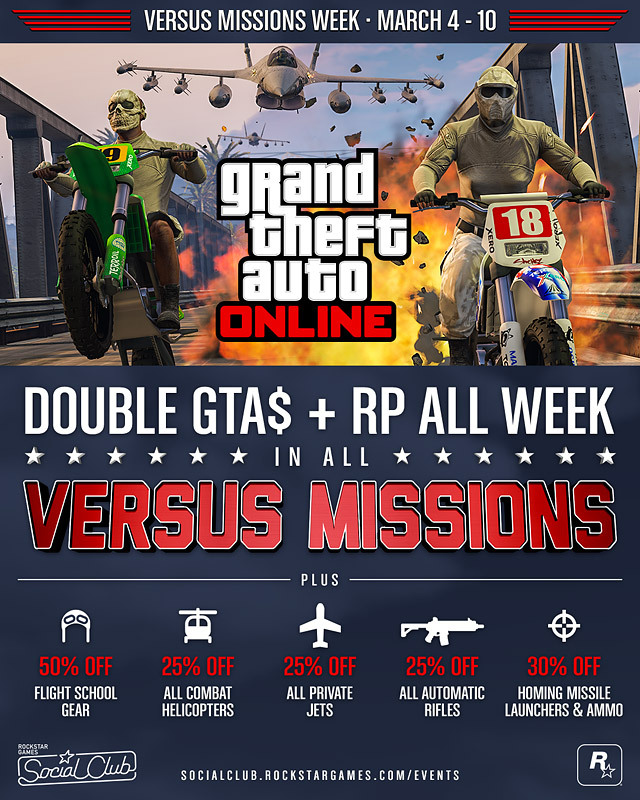 Versus Missions Week: 2x GTA$ & RP - From now through March 10th get twice the GTA$ and RP on all Versus missions in GTA Online plus some discounts on items.